Often, you need to explore the relationship between two characteristics in a Six Sigma initiative. To do so, you use a scatter plot. Scatter plots get their name from their appearance — a scattered cluster of dots on a graph. Scatter plots are a simple yet extremely powerful tool you can use to explore and quantify the relationship between two or more characteristics. Scatter plots start to get to the root of how certain variables impact other variables — how certain inputs either inhibit or enhance your ability to create your desired outcomes. This analysis is really the start of getting to the fundamental Y = f(X) + ε relationship at the heart of Six Sigma improvement. The key to creating a scatter plot is in capturing the measurement data. To investigate the relationship between two characteristics, you need to capture measurements from the two characteristics simultaneously. If you’re interested in exploring the relationship between characteristics X and Y, at each point of measurement, you have to collect and record values for X and Y. The two characteristics you’re plotting can be two inputs; one can be an input and the other can be an output; or they can be two outputs. As long as you make your measurements simultaneously, whether they’re inputs or outputs doesn’t matter. Form points from the collected data. At each of the measurement times, pair the simultaneously measured values for the two characteristics together to form an (x, y) point that can be plotted on a two-axis graph. Create a two-axis plotting framework. Create two axes, one horizontal and the other vertical, with each being assigned to one of the two characteristics under investigation. The scale for each axis can be in millimeters for length, pounds for weight, minutes for time, number of defects found on an inspected part, or anything else that quantifies what aspect of the characteristics you’re interested in. Plot each formed point on the two-axis framework. 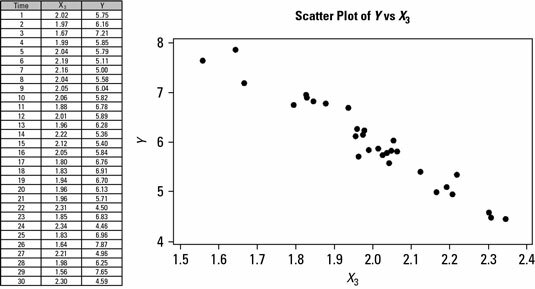 Scatter plots can also be created when one of the characteristic data types isn’t measured on a continuous scale but fits into discrete categories. For example, the characteristic of sales volume (measured on the continuous dollar scale) can be plotted against marketing plans 1 and 2 (measured by two discrete categories).